Happy New Year - And Many More This Year ! As the hours tick by to the start of 2012, I want to wish you and yours the very best for 2012. If you like one New Years Day, how about a few over the next 366 days? With our western Gregorian calendar, we will be enjoying a leap year. That one extra February 29 when all of those leap year babies get to celebrate a traditional birthday and when the slight errors in our 365 day calendar can be caught up with. The Chinese New Year 4709, will begin on January 23. This is the year of the water dragon, which sounds like a very good year. The last year of the water dragon was for those flower children born between January 27, 1952 and February 13, 1953. At sunset on September 16, the Hebrew calendar celebrates Rosh Hashanah, or New Year's Day 5773. The Hijri or Islamic calendar will celebrate New Year's Day 1434 beginning at sunset November 14. The Mayan calendar will be THE topic this year. On December 21, the 5125 year great cycle will begin anew. I have embedded an YouTube clip that is pretty interesting about the Mayan circular calendar. December 21, winter solstice, is the Mayan New Year's Day this year, and a date wherein both the Maya lunar and solar calendars have coinciding New Year Days. That only happens every 52 years, and so last occurred in 1960. With each New Year we have renewed potential, renewed optimism, and a renewed chance to improve not only ourselves, but the world in which we live. The very best to you and your family in 2012, 4709, 5773, 1434, and as we observe the end of 5125 and usher in the beginning of 1. What Are Your Predictions For 2012? It is obvious that I am occupied with things other than this blog. So much worthy news to comment upon and I am not posting. So, for those who have checked in to see if anything new will ever again appear on this site -- why yes it will, just sporadically until the holidays and my end of year tasks are completed. So, for both my readers' amusement, I ask for your predictions for 2012. I'll start it off with one of my own. The City-County Council and the Mayor will not agree on anything this year EXCEPT they will agree to give more money to the CIB. Not the Libraries. Not IndyGo. Just the CIB. So, any thoughts for the new year? Are Democrat Votes Lacking For Smoking Ban? Tonight is the last Council meeting of the year, and the last where the Republican majority will reign. Among other items of interest on tonight's agenda is the glaring absence of Prop 352, the Vaughn proposal to extend Indy's smoking ban. That proposal failed to get out of last week's meeting of the Rules committee - only Councillors Vaughn and McQuillin voted to send it to the full Council for a floor vote. Councillors Cockrum, Lutz, Rivera, Gray, Sanders and Mansfield voted to kill it then and there. From the beginning, the Democratic caucus' response to this proposal was worse than tepid. Caucus leader, Joanne Sanders, continually referred to it as an attempt for Vaughn to take credit from Councillor Angela Mansfield's years long efforts. Her unswerving distrust/dislike of Vaughn finally culminated at last week's Rules committee meeting in her theorizing that the entire proposal was a setup for defeating any extension of the smoking ban. As is usually the case with conspiracy theories, the folks accused of fabricating them just aren't that smart and clever. Mansfield also showed contempt for the backers of the proposal and, despite the support it eventually got from interested organizations, she declared she would not ask her caucus to support it. In the end, she voted against it in the Rules committee. Well, I'll venture a possible additional reason for not wanting a floor vote on the proposal. It just may be that the Democrats couldn't get enough votes for Prop 352, even if they all put their feelings about Vaughn aside like the adults we all expect them to be. The potential embarrassment just might have been too much to endure. I've been looking at past votes and needed votes to pass the extension of the smoking ban. Prop 352 would require 15 votes for passage. Vaughn had his and Councillors Hunter, Malone and McQuillen's votes to contribute to the 'yes' side of the tally. So the Ds would need to come up with 11 yes votes out of 13 Democrats voting to secure passage. During last week's Rules Committee meeting, Democrat Councillor Gray demonstrated an interest in maintaining some significant exemptions to a complete ban when he voted against two of Mansfield's amendments - one to remove Vaughn's exemption of the downtown off track betting facility, and the other to deny the ability to transfer a tobacco store or hookah bar license that would exempt those facilities from the smoking ban; both amendments failed. He also voted against sending the proposal to the full Council for a floor vote, along with Sanders and Mansfield. Back in 2009, Gray voted in favor of amending a proposed extension of the smoking ban so that the ordinance would continue to exclude fraternal organizations and tobacco stores, then curiously asked to be allowed not to vote on the actual proposal in order to avoid the appearance of a conflict of interest. No further explanation is available in the minutes. So, ultimately, Gray's position on an extension of the smoking ban is not certain. The amendment, had it passed back in 2009, would have resulted in a modified proposal that is quite similar to the one introduced by Vaughn last month. Councillor Dane Mahern asked to be allowed not to vote on both the amendment and the proposal to avoid the appearance of a conflict of interest due to a previously scheduled fundraiser. So, his position is not on the record. Councillor Brown said that 98% of establishments were impacted by the current ban, and he asked if there are statistics showing the number of workers that were impacted. Seeing no response, Councillor Brown asked if there are any statistics showing the number of workers that will further be affected. Councillor B. Mahern said that if they affect one worker it is worth it. Councillor Brown said that through education, he continues to support non-smoking initiatives, but he would like to see an accounting of the percentage of reduction in second hand smoke deaths since the ban to warrant a further ban. Councillor Hunter said that second-hand smoke deaths are down across the country by 62 million. Brown voted for the amendment loosening the proposal (the amendment that failed) and against the proposal. Oliver was noted in the minutes proposing an amendment to exempt bowling alleys, which did not receive a second. He vote against the other amendment and the final proposal as well. Not in attendance that night were Councillors Pfisterer and Minton-McNeill. The latter testified against Vaughn's proposal last week, saying an all or nothing ban was required so as to maintain a level playing field between hookah bars and mom and pop tavern operations. It is possible that some of the 8 Democrat votes would not be cast for anything but a complete ban. So, all put together, if Prop 352 had come before the full Council tonight, victory was not assured, even without all of the political mishigas. There would be 4 Republican yes votes, 8 likely (but not sure) Democrat yes votes, one likely Democrat no vote, and 4 uncertain D votes - at best. It would have been a nail biter. But, it would have been a public service to hold the vote. This week's Fundy goes to the entire staff of WCTY, AKA "the government channel" folks. They are the usually unseen stalwarts who cover every City Council meeting, including all of their committee meetings save the committee on committees, and all Board and Commission hearings held in the City-County Building. They travel around town with cameras in tow, nights and weekends, to cover community meetings and Mayor's Nights Out. Led for years now by Station Manager Ken Montgomery, the crew provides live broadcasts and taped archives so that all citizens of Marion County can keep their own eye on what is getting done and who is doing what in City government. As they say, sunshine is the best disinfectant. And with that sentiment, nothing can beat what the WCTY folks do for all of us and our Democracy, each and every day. If you don't know, all shows are archived and can be viewed at any time of the day or night at indy.gov/cable . The crew is small, but work diligently. They are Christy Thomas, Alan Dhayer, Bradley Sims, Nick Hess, Tim Barrett, and Dave Lister. I've only seen one Councillor do it, but maybe I've just missed others. I always get a chuckle out of it when Councillor Bob Lutz gets ready to call his committee together. He looks at the camera, says "are you ready? ", and the camera nods in assent. While they may be out of view, they do their jobs with the greatest professionalism and they give us all access to what those in power are up to. The Council's Democratic Caucus is blowing it big time, and the impact of their posture on the proposed expansion of the smoking ban is wide ranging. The epicenter of all this is the expansion of the smoking ban proposed by Council President Ryan Vaughn, due to be heard at tonight's Rules committee meeting. It is not Vaughn's actions, however, it is the reaction of Council Democrats to Vaughn that is causing the image of their Caucus to take a hit. ...when your opponents give you 98 percent of what you want, it's politically unwise and even petty to pout over the 2 percent you didn't get. Yet, that's exactly what's happening in the debate over a comprehensive workplace smoking ban. Councillor Angela Mansfield, whose reputation has been one of an intelligent, thoughtful Councillor, is taking a hit from what appears to be petulance on being one-upped by Vaughn. She must know that Vaughn is saving the Mayor the major embarrassment of vetoing a proposal to be introduced next year that would not exclude fraternal clubs and organizations. But she also must know that her hard work on a proposal that could pass the Council with the newly added Democratic votes, is likely to be vetoed by Ballard - ending her hopes to expand the smoking ban yet again. Councillor Joanne Sanders is echoing Mansfield in telling the press that she will not promote Vaughn's proposal within the Caucus. As the Star put it, just declare victory and move on. 1) It takes the limelight away from Vaughn's push to adopt new Council districts in advance of a Democratic majority taking over the Council come January. You cannot simultaneously pose as the adult in the room and act in ways that garner the use of the word "pout" by the City's largest newspaper. 2) It affects the public perception of how seriously the new Council will take important issues that arise next year and after. 3) It also removes from Mayor Greg Ballard, the stigma of being unable to work across the aisle with Democrats. The Democrats are now seen in an unfavorable, unreasonable light, due to their own words and actions; lightening any pressure Ballard may have received from the public to cooperate. Now, any fault for a paralyzed government will not be assigned solely to Ballard, but to the Council Democratic Caucus in equal measure. The Democrats have little time to turn their actions and the public's perception of their motives around. The Caucus should have been able to celebrate the changing of the guard on January 1. Instead they have to make it clear that the public interest is their interest and fix the response to the Vaughn smoking ban proposal with all haste. This week's Fundy award for good government goes to Melissa Thompson, Clerk of the City-County Council. Ms. Thompson's merit for this award is her dedication to producing records when requested by a member of the public. Some offices in City government, most notably the Mayor's office and the Office of Corporation Counsel, shred the intent of the open records laws daily, only clinging to the minimum legal requirements under state law while deliberately delaying and setting up unspoken requirements for getting documents - like asking twice. Luckily, not everyone in City Hall handles requests this way. Even if all City departments and agencies were vigorous in allowing access to public records, Ms. Thompson would stand out. She fulfills requests quickly; nearly all of mine have been within the day the request was made. She takes time out to elaborate on how to navigate some otherwise arcane Council jargon. And she delivers it all in a highly professional manner. Clerk of the Council is a political appointment, so Ms. Thompson's days on staff are now limited. Hopefully for the citizens of Indianapolis, her replacement will continue her strong dedication to fulfilling the spirit and letter of the open records laws. I wish her much success in her new endeavors, and thank her for her valuable stewardship of the Council Office. Last evening the Land Use Committee of the Broad Ripple Village Association voted unanimously to 'not support' the variance requests for the proposed Broad Ripple parking garage. As you know, the garage is proposed for the corner of North College Avenue and Westfield Boulevard; the development of which is to get $6.35 million from the City as part of its acquisition, demolition, and construction costs (see "Broad Ripple Parking Garage - Farce Extraordinaire" and "Broad Ripple Parking Garage - Somebody Forgot To Which End of the Horse You Attach the Cart" on this blog and Ogden On Politics' "The Tale of the Broad Ripple Parking Garage: Taxpayers Pay to Build the Facility While the Developer Gets 100% of the Ownership and Revenue" for the highlights and more links). The requested variances, if granted, would allow the building to avoid the setbacks required by City Ordinance and reach up to the City's right of way (which would basically be the sidewalk), allow smaller than required parking spaces, and allow a bank drive through without required maneuvering space. The developer has also requested a vacation of the City's air rights and subterranean rights above and below the sidewalk so that the building facade can extend beyond the owner's parcel. Particular sticking points for the BRVA group are the setback variance request for Westfield Boulevard and the proposed drive through for the bank tenant of the garage, among other disappointments that members of the committee have had with the overall project. The BRVA Land Use Committee joins remonstrance by the Meridian Kessler Neighbors Helping Neighbors, and neighboring veterinarian, Dr. Brunner, of the Broad Ripple Animal Clinic that abuts the garage property. The Board of Zoning Appeals will consider the variance petition this Tuesday, December 13. The Plat Committee of the Metropolitan Development Commission will consider the vacation request at its January 11 meeting, the original hearing being continued by the Meridian Kessler group. How Much Is the Superbowl Costing Indianapolis and Indiana Taxpayers? Paul Ogden has a riveting blog entry today about the real cost to cities and states that host Super Bowls. I highly recommend "Sports Economist Says Indianapolis is Big Loser Financially From Hosting Super Bowl" to all taxpayers of Indianapolis and, yes, even all of Indiana. Meanwhile, Council President Ryan Vaughn - before the election - promised the Council that he would do his best to get the Ballard Administration to cough up information about how much cash the February Super Bowl is costing Indianapolis. So far, nothing has come forward. And considering how much water Vaughn is carrying for Ballard these days, it leaves this writer wondering why they will not tell the public what the price tag is. Its like we all went through the Looking Glass with Alice the day the City opted for the Keystone Group's proposal to build a garage on the corner of N. College Avenue and Westfield Boulevard in Broad Ripple. I reported previously (see "Broad Ripple Parking Garage - Somebody Forgot To Which End of the Horse You Attach the Cart") about the fact that after the deal was inked down, Keystone Group, now going by 6280, LLC, for this project, filed for a number of variances. Turns out the project as proposed and as accepted by the City, will not fit on the property without A) a variance for zero foot setback from the right of way (35 foot setback on College and 40 foot setback on Westfield required) and B) a variance to shrink the size of each parking space. At what point does the Ballard administration admit that this project is too large for this site? Well, as absurd as things were up to the point of filing for the variances, an alert reader gave us a heads up that things were actually even more absurd than we thought. The folks at 6280, LLC, have also filed to extend into the City's right of way - meaning, they cannot fit in the space they actually own and must spill over and under the sidewalk. The technical request is to 'vacate' the right of way from 17 feet up in the air to 62 feet up in the air on the three sides of the building, and to 'vacate' the right of way from 1 foot below ground to 8 feet below ground all the way around the building. The 'ribbon of light' facade, it turns out, can't fit on the building if the entire building is actually required to fit on the lot. Rather, the property is so inappropriate for the project, that the ribbon must be allowed to hang over the sidewalk and the alley if it is to be a part of the plan at all. The developer says that the underground vacation is required for structural support, but that makes no sense. How much more information does the Administration require as proof that this project is not on the right site? The garage costs twice as much as comparable projects (even those cited by the developer in their own proposal), it is proposed for a location rejected in a 2007 study of Broad Ripple's parking needs, the building can't fit on the property without being granted a variance, and even then, the building is too small to fit 350 regulation size parking spaces in it without further variance, AND EVEN THEN the facade will not fit on the building without hanging over the sidewalk. When does it become apparent that the project does not fit on the property? It is all too absurd, even for government work. I fully expect another round of variance requests should the pending matters be granted. The 'ribbon of light' is proposed to serve as an advertising beacon. That, of course, is not allowed by our ordinances. The Board of Zoning Appeals is scheduled to consider the filed variance requests on December 13 and the Plat Committee of the Metropolitan Development Commission is scheduled to consider the vacation of air and subterranean rights of way on December 14. Maybe these bodies will bring sensible resolution to this farce by denying the petitions presented to them. Please bear with me before you start groaning with derision. It seems to me that there are fundamental aspects to good government and good governance. Open, transparent, accessible government - for instance. Working in the best interest of the community, not special interests - for instance. Good stewardship, leadership, vision - for instance. It also seems to me that there are folks who serve in our local government who demonstrate a fundamental aspect of good government on a daily basis, and others who do so from time to time. Dare I say it so clearly but -- not all is wrong with our local governance. So, in order to promote it when I see it, I am instituting a new feature to Had Enough Indy ? It will be an award worth the paper it is written on. I'll call it the Fundamental Friday Award - or "Fundy" for short. The inaugural Fundy (drum roll, please) goes to Councillors Angela Mansfield, Ben Hunter, and Ryan Vaughn, and Mayor Greg Ballard. The reason is - compromise when compromise will bring about benefits to the community. In years gone by we might have called it statesmanship - putting the needs of the people before party politics or grandstanding opportunities. The topic involved is, as you already know, the enlargement of Indy's smoking ban that will still fall short, but not far short, of a complete ban. However, it will be as close as all sides can get if they hope to garner enough votes for passage and to win the Mayor's signature. Mansfield and Hunter have been working together, across the political aisle, for years now, trying to move the smoking ban forward. They were ready to reintroduce a previously defeated measure once the Democrats took control of the Council in January, but a measure unlikely to be signed by the Mayor. Vaughn threw a Hail Mary pass in the last minutes of Republican control; likely to give Mayor Ballard something he could stomach and sign, saving him face. Nonetheless, they all came together and are now lending their support to an slightly more aggressive Vaughn measure. So, include the coming together to work for the benefit of the public, to the art of compromise when compromise will bring benefits to the community, as the reasons why the very first Fundy goes to Mansfield, Hunter, Vaughn, and Ballard. 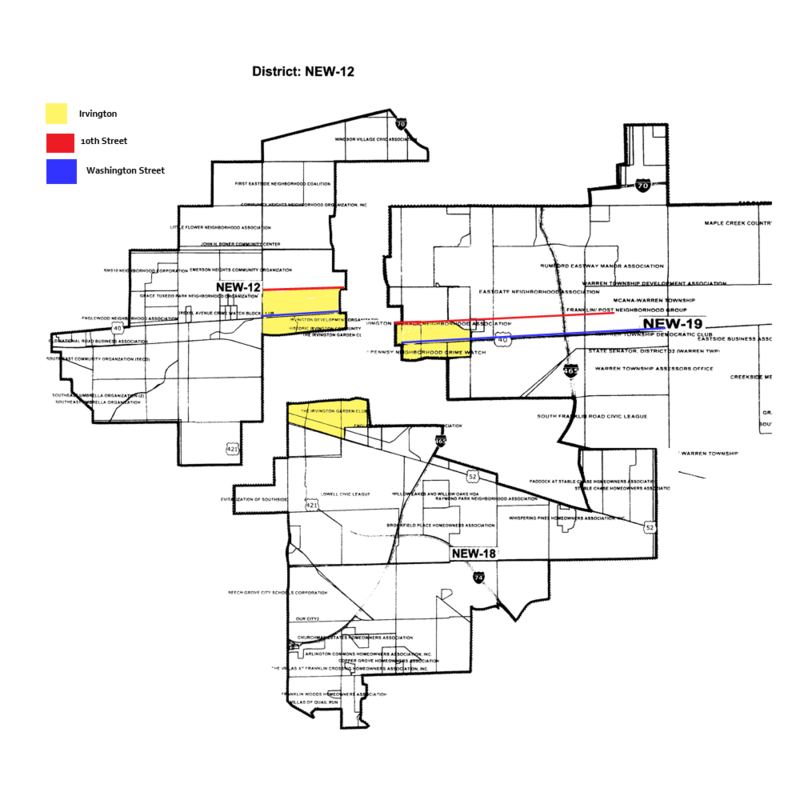 One of the legal goals for creating new districts, for the Council or any other governmental unit, is to keep what are called "communities of interest" intact. The proposed new Council Districts, to be introduced at the December 5 Council meeting, totally misses the mark where Irvington is concerned. Jonathan Katz has gone to the trouble of demonstrating clearly how Irvington is divided from its heart into not one, not two, but three different Council districts. Below is his highlighted map. The yellow-shaded area is Irvington. Pieced together are the proposed new districts 12, 18 and 19. Irvington is an historic district that is coming back through the inspiring tug and pull of its dedicated, focused, residents. I should say that it at the point of being successful and on the verge of being stably successful. It doesn't need to be mishandled by the new Council map. All efforts should be put forward by Ryan Vaughn, the steam roller behind getting these maps enacted, to correct this grievous error. The community of Irvington deserves to be left intact within one Council district with one Councillor as dedicated as these residents are to Irvington. I must apologize to my readers for substantial error in my post yesterday. I said that the Mayor did not have to correct errors in the precincts due to the State Legislature's creation of its new districts. That is not entirely true. I have been trying to track down the actual genesis of the problem, but, at this point all I can say is that the State Legislature, through HB 1601, did require the Mayor Ballard to review census data on all precincts sent to him by the State's Election Division, and either submit corrections to the precincts affected, or re-precinct entirely. The bill anticipated little cost to the County, with the Legislative Services Agency stating "Explanation of Local Expenditures: County Executives- County executives should require only a minimal increase in administrative time to send the ED the information required by the bill", in its Fiscal Impact Analysis. While I am not able to say if it was poorly drafted Legislative districts or Congressional districts (which did use census blocks instead of precincts in their legal descriptions) (see IC 2-1-12, IC 2-1-13, and IC 3-3-5, respectively) it is certain that some action regarding the evaluation and correction of precinct boundaries was legally required of Mayor Ballard.